Meditation is the practice where you channelize your focus towards training your mind and develop a consciousness that will help you grow. Meditation promotes relaxation, makes you stronger as a person, makes you more calmer and peaceful, controls anger and aggression.It also helps you develop forgiveness and generosity. There are many forms of meditation and among the most popular methods is the Buddhist Meditation. The most basic kind of Buddhist meditation technique is called Anapana Sati or mindfulness meditation. If you want to know how it is done, we tell you here the Basic Buddhist Meditation techniques for beginners. Who can do this meditation? There is no age bar to start on this meditation. If you can dedicate 15 minutes with undivided attention towards meditation and are open to exploring its benefits, you are a candidate who can do this meditation. What is the goal of this meditation? According to Buddha, practicing Anapana Sati is the “gateway of enlightenment”. In other words, it will help you becomes self aware, make you focus on the bigger picture and stop you from wasting your precious energy on the trivial. Practicing Anapana Sati paves way to the next step of meditation called Vipassana which will purify your mind. What are the Buddhist Meditation Techniques for Beginners? To do this meditation, you need 4 things – a quiet place, time, a posture and discipline towards practice. Start by finding a quiet spot at home or in the park. Get a mat or pillow or a big cushion on which you can sit. Sit on it cross legged or in a lotus position- whatever you are comfortable with. Your arms rest on the lap with your right palm placed on top of your left. Your thumbs must be touching each other at the tips. Alternatively, you can place your palms on your knees, the thumb and index finger tips touching each other. Keep your spine straight so as to allow the energy to flow through your body smoothly. Now start observing your breath. Bring your focus to your nostrils and upper lip. Observe the intake of breath and the breath that is expelled from the nostrils onto the upper lip. Do this for at least 15 minutes in the beginning. You can slowly increase the duration by 5 minutes every week. Try to keep your mind empty as you are meditating. If you are getting thoughts, say of feeding your fish, then tell yourself, “i just thought about feeding my fish, now back to meditation” and go back to meditating. In the first two weeks, you can count as you breathe so as to avoid any other thoughts from streaming into the mind. It is best if you keep an timer or alarm for 15 minutes when you start so that you won’t have the thought running in your mind as to whether you have completed the 15 minutes of meditation. Be disciplined and practice the meditation everyday. As the weeks progress, increase the duration of the meditation. 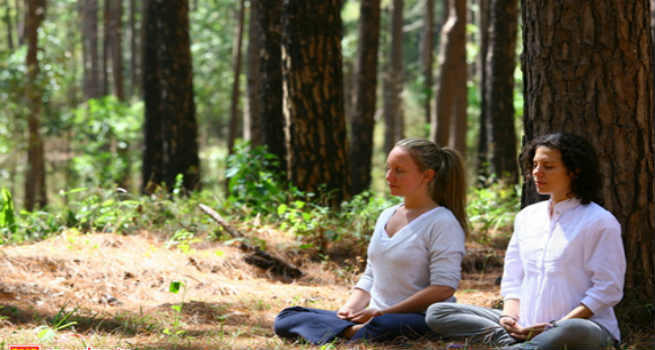 Meditation helps relieve your mental and physical stress. For those 15 minutes, since you are getting complete physical and mental relaxation, it rejuvenates you. It helps relieve any chronic pain in the back or headaches. Meditating before your bedtime helps cure insomnia. Meditating regularly helps you improve your focus. You will be able to brush aside diversions and focus on your goals more effectively. It helps flush out negative energies of anger and aggression from your system and makes you calmer and peaceful. So why not try out these Buddhist Meditation Techniques for beginners and take the first step towards great physical and mental well being?